The Holiday Inn Washington DC - Central/White House is committed to promoting the use of sustainable transportation as a way to reduce local traffic congestion, air pollution and greenhouse gas emissions. While we do provide driving information, please consider some of the District’s other transportation options, which are all included on goDCgo.com’s interactive map. Metrorail: The closest Metrorail stations to the Holiday Inn Washington, DC are the, Dupont Circle Metro (0.49 mi) on the Red Line, (Farragut North Station (0.55 mi) on the Red Line, and the McPherson Square Station (0.47 mi) on the Orange and Blue Lines. 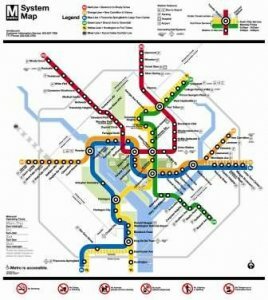 We also offer a See DC by Metro Package For more information and for a Metrorail Map, visit the WMATA website. Metrobus: Metrobuses that stop within ¼ mile include the 52, 53, 54, G2, S1, S2, S4 and S9. For more information about routes and fares, visit the WMATA website. Have questions about riding the Metro? Our courteous Guest Service Representatives look forward to assisting you. Feel free to contact us with any questions about riding Metro (202) 483-2000 or (800) 248-0016.